Do you have those days when you feel like you are Supermom? Able to get everything done, everything in it's place and everyone is happy! Well, this Supermom sure can take care of all those things and more. 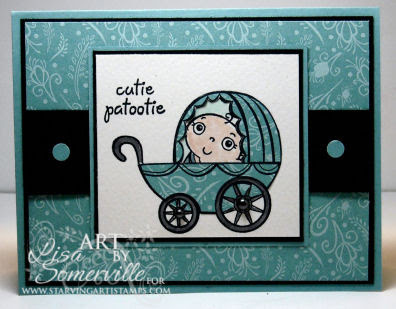 She's from the new DoodleFactory set at Starving Artistamps. The DoodleFactory Neighborhood was stamped in Black on Watercolor paper then colored using the Marker Watercoloring Technique. I sponged the edges with Chocolate Chip Ink. 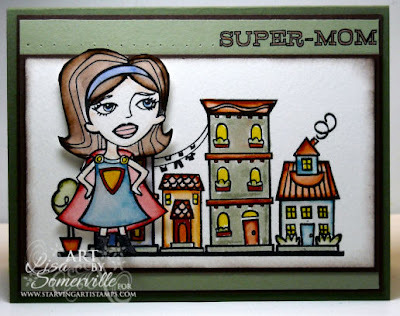 Supermom is also stamped and colored the same way, then popped up on dimensionals over the image. The sentiment is from the coordinating Baby Sentiments. Here's Supermom's baby - isn't he sweet! I stamped the buggy on a scrap of Watercolor paper, then did some reverse masking using my Eclipse Tape to add the baby image to the buggy. Used some DSP to Paper Piece the Buggy in a pretty printed pattern. Colored in the images with markers and added black stick on Pearls to the centers of the wheels. These cards are headed to Starving Artistamps for their upcoming shows - if you visit them be sure to look for these and other samples on their display boards. Both these cards are ADORABLE! What an awesome job you did with your masking and paper piecing! You do such impressive work, Lisa! These will be added to my "Lisa" folder!